NELLIE STEWART, the darling of the Australian stage in the Victorian era, was born on November 28, 1858, in Woolloomooloo, Sydney. She came from a long line of theatre folk and it was as a member of her father's travelling company that she made her debut, aged only two or three, at Coppin's Haymarket Theatre, Melbourne. Her role was that of a child in a five-act drama titled The Little Stranger. "I can remember quite distinctly," she wrote, "being dressed in a black velvet pelisse and a pork pie hat. After I'd been on stage a few minutes father whispered to me, 'Go back to mother.' I trotted off and she gave me a big piece of toffee." She was, even as a young girl, an all-round performer. She learnt to fence, to dance and to sing, her education was never neglected and there was no doubt whatever about her acting talent. Her big chance came in 1880. From small character parts, she had graduated to a musical medley called Rainbow Revels, specially written for Richard Stewart and his family. This production took her to India, Europe and the USA, and it was while playing in the latter country that she received an urgent call to return to Melbourne. She was wanted there as principal boy in George Coppin's pantomime, Sinbad the Sailor. A record run resulted and after that she was cast in her first really big success - the role of Griolet, the drummer boy, in the musical La Fille du Tambour Major. She had become the toast of the eighties, the idol of Australian theatre. Comic opera followed, and from La Mascotte, one of her most memorable triumphs, she graduated to exacting roles in Gilbert and Sullivan operas. Now under the patronage of producer George Musgrove, whom she described as her "great and good man" she made regular appearances in them here and abroad and it was said of her that "... even in England, the home of Gilbert and Sullivan, they have never seen a better Mabel in Pirates of Penzance or a more appealing Elsie in The Yeoman of the Guard. Outstanding too was her performance of Yum Yum in The Mikado. In 13 years of touring she sang the leading role in 35 different comic operas. Physically she was tough and she had an unfaitering belief in the legend that "the play must go on". Once when playing Jack in the pantomime. Jack and the Beanstalk she fell from the beanstalk and broke her arm. Despite the not inconsiderable pain she simply had the arm strapped up, refused the suggestion that she should hand over to her understudy and went on with the show. Then in 1902 came the play most surely associated with her name - Sweet Nell of Old Drury. She was 44 when J. C. Williamson starred her in the production at the Melbourne Princess Theatre and although her singing voice had gone audiences still loved her, still flocked in their hundreds to see her. Talma & Co., photographers. Nellie Stewart. ca. 1910. Gelatin silver photograph with hand colouring. theatrical and literary portraits. H37081/29. The role, after her long career in comic opera, established her as a straight actress. 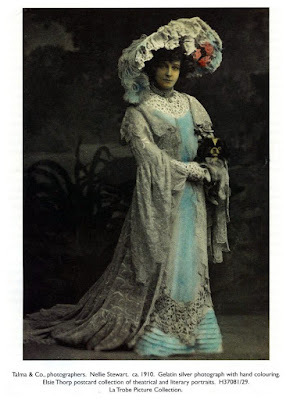 Her popularity was at its height; and when, in 1909, Sweet Nell was revived in Melbourne the management, says Hal Porter in his book Stars of Australian Stage and Screen, "served afternoon tea and scones to the playgoers who had been in line since eleven in the morning." Nellie had married Richard Row in 1884. The marriage was a failure and with the directness and commonsense that characterised this woman in an age of male dominance, she packed her bags and left the matrimonial home. She never married again but for 30 years she was "the friend" of George Musgrove, long associated with J. C. Williamson and Arthur Garner in the birthpangs of the modern Australian commercial theatre. He was with her on tour in San Francisco when the great earthquake brought them close to financial disaster and later, in 1911, starred with Nellie in pioneer film-maker Raymond Longford's screen version of Sweet Nell of Old Drury. He died in 1916. Nellie made her final stage appearance at the Melbourne Comedy Theatre as Cavallani in the play Romance. That was in July, 1930 and, according to those who remember, she looked from the stalls like a young and attractive woman. Her fans were still legion when, in 1931, death brought to an end the remarkable career of a remarkable woman. Theatre was in the blood of those Victorian stage charmers; at least half a dozen who come to mind began their careers when little more than babies. Ada Reeve, the Gaiety girl and one of our best-loved musical and revue entertainers, made her first appearance in pantomime at the age of five. 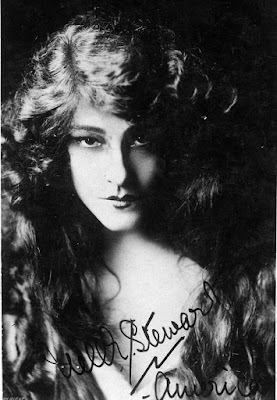 Tittell Brune, Australia's Peter Pan and a dramatic actress of considerable ability was starting out for stardom when only four and a half. Carrie Moore, of Merry Widow fame, knew the smell of grease paint when only a child, while her earlier namesake, Maggie Moore, who came to Australia with J. C. Williamson. was seven when she made her stage debut. It is a formidable list that goes back through an era of great talent. Is this the world's smallest castle?